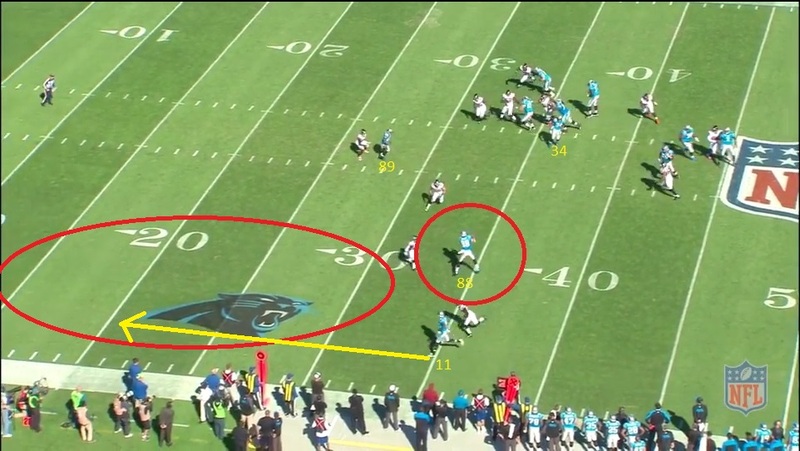 Early in the game against the Falcons, Mike Shula dialed up a play I’ve yet to see this year. While the result was a modest gain of eight yards, it’s a play that by design could work a number of times, and has the potential to result in a much bigger gain. The situation is second down and 10 yards to go from the Atlanta 39. Quarterback Cam Newton is in the Shotgun, with Running Back DeAngelo Williams to his left. 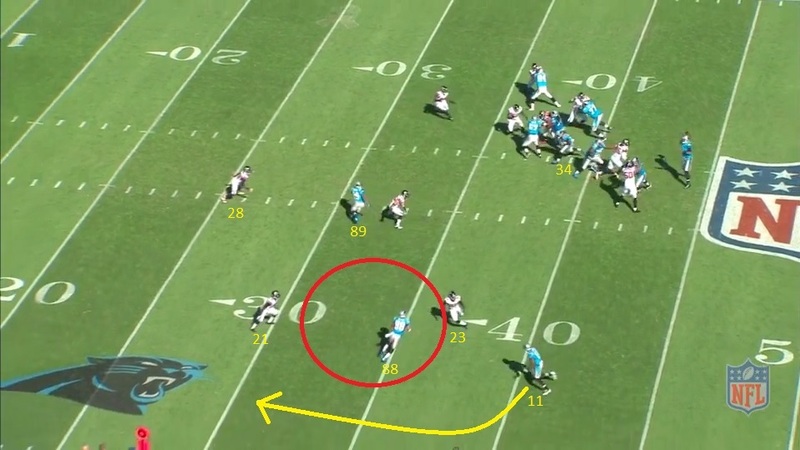 He has a three wide formation to his left, with Wide Receiver Steve Smith playing inside on the line of scrimmage, and WR Brandon LaFell as well as Tight End Greg Olsen outside of him. The play utilizes Play Action out of the back field, and then Williams releases just past the line of scrimmage as the check down option. Smith will run the inside post. Because of the play maker Smith is, this will by design keep the Safety Thomas DeCoud in the center of the field. Notice how far off Cornerbacks Robert Alford and Desmond Trufant are? This will come into play as the routes form. As the ball is snapped, LaFell instantly gives Alford the look of a bubble screen. This causes Robert Alford to bite and shoot up field to defend the quick screen pass. 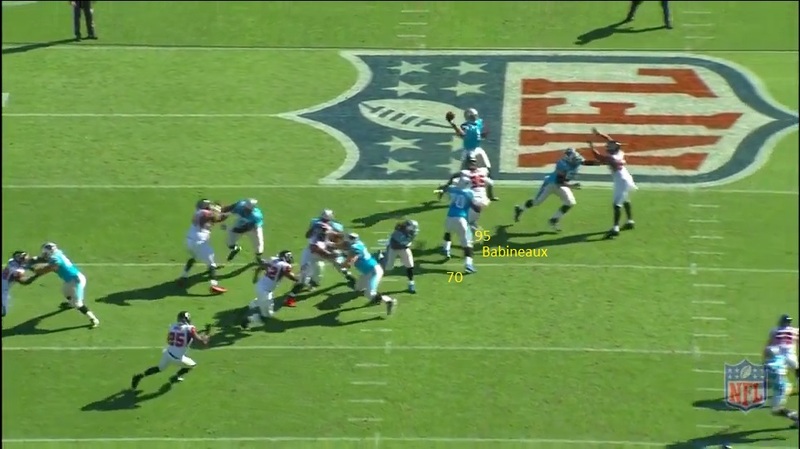 At the same time, CB Desmond Trufant maintains his distance from TE Greg Olsen so as to not let Olsen get behind him. Instead of getting up field to jam Olsen out of his break, Trufant drops back to the 30 yard line to protect the play at the sticks. DeCoud is playing Smith the entire way, and as the ball is snapped begins creeping up to help on the Panthers explosive WR. Here’s where the play catches my eye though. LaFell turns his bubble route into a wheel route, forcing the defender (Alford) to try to adjust to recover. Alford was in front of Olsen’s route, but with LaFell’s move up the sideline is forced to vacate the area, leaving an open hole in the Atlanta defense. If DeCoud was on this side of the field to help Trufant could break on Olsen, but with no help over the top on the left side he has to stay back. Because of quick pressure by Defensive Tackle Jonathan Babineaux, Cam is forced to make an early decision. 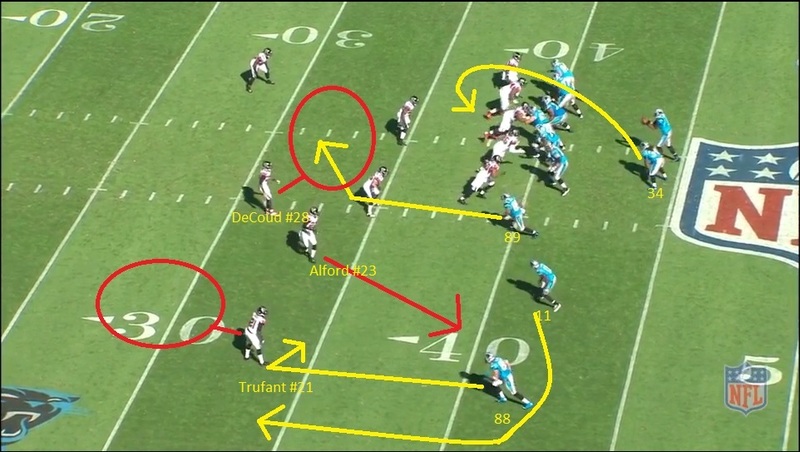 The wheel route clears Alford out, and Newton is given an easy target in the form of his TE Greg Olsen on the comeback route. Because Trufant was playing so far off of the TE, Olsen is able to get another three yards after the catch and set up a manageable third and two from the Atlanta 31. This is where the bigger play part of the analysis comes in. Notice the huge red circle up the left sideline? There’s no Safety help over the top, and LaFell has a step on Alford at this point (was almost level with him when ball was thrown). If Newton has a fraction of a second longer in the pocket this is an easy touchdown for the Panthers. This play shows what having a player of Steve Smith’s caliber can do for an offense, even when he’s not getting the ball. The Falcon’s know they have to commit extra attention to Smith, and because of this two capable play makers are left in single coverage. The screen route LaFell uses to set up the wheel creates confusion with a young DB, and by the time he show’s his true intentions LaFell has put Alford in a very difficult position to recover from. 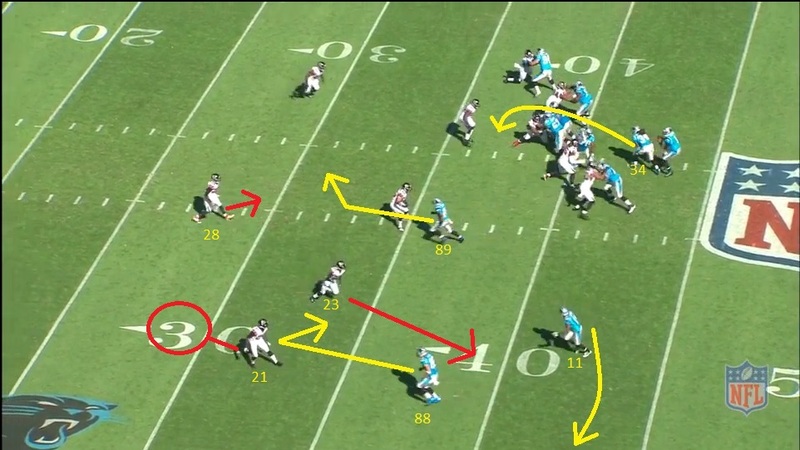 While some of the success of this play is due to soft coverage by the Falcons, the routes could be modified to create opportunities against press coverage as well. Against the press, LaFell could sell the same bubble screen and turn up field, at the same time instead of a comeback route, Olsen could run a quick slant to get inside the defender. While the gain might be a modest 4-5 yards, it’s still almost automatic by design. With a slight personnel tweak, the Panthers could create an even more dangerous play by using Tedd Ginn in LaFell’s position. Not only does Ginn give you elusive ability after the catch in the event you throw the bubble screen, but he’s also a player who can get behind a single defender easily. Either way, this is a play I could certainly see the Panthers coming back to several times down the stretch. Now that defenses have it on tape they’ll have to be selective, and disguise their intentions to the Defense, but the possibilities the play design creates can certainly cause headaches for a Defense.